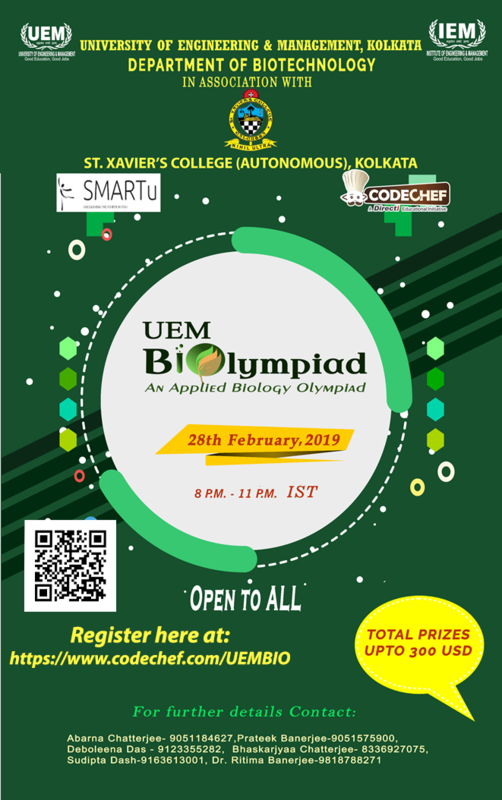 Organiser: The contest is hosted by University of Engineering & Management (UEM), Kolkata. Rank 1 : Award of USD 150 along with certificate of merit. Rank 2 : Award of USD 100 along with certificate of merit. Rank 3 : Award of USD 50 along with certificate of merit. Please contact ritimabanerjee@gmail.com for any queries during the contest. Every participant will be participating on his/ her own. No collaboration is allowed. It is an individual contest. You will not be able to view the second question unless you have successfully solved the first question. Similarly, only after you solve the second will you be able to unlock the third question, and so on. After successfully solving a question, come back to the contest page, and the next problem should be unlocked for you. You might have to wait for up to 20 seconds for this. Ranking will be done on the basis of total score. Ties will be broken according to the time taken to reach that score. Atmost two attempts are permitted for every question. Please type the correct option and click on submit button. For example, if the correct option is a, type a (case sensitive) and click on submit. Upper age limit is restricted to 24 (as on the day of the examination) for getting prize money. All prize winners (Ranks 1-3) need to give a valid date of birth proof.